Homemade Sponge Bob costumes are easy to make and often look better than store bought outfits. 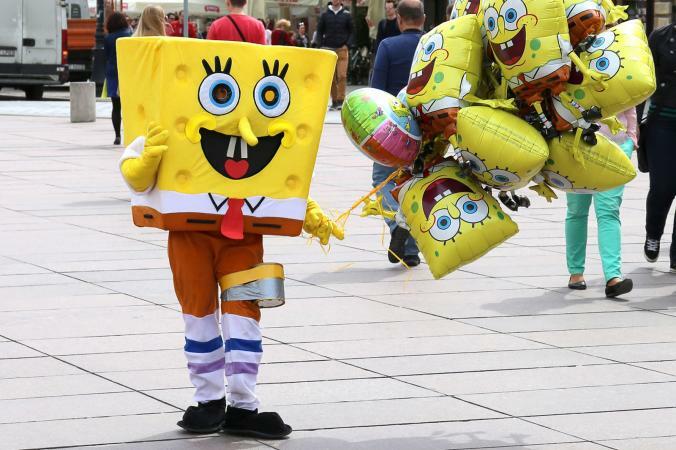 Sponge Bob costumes are popular for children and adults alike. Sponge Bob is a popular animated character from the cartoon that started airing in 1999 and is still very popular today. The SpongeBob Square Pants cartoon, even though it airs on the children's Nickelodeon channel, has irreverent humor that can be entertaining for adults as well. Sponge Bob toys and costumes are marketed fiercely and have yet to go out of style. Making homemade Sponge Bob costumes, for an adult or child is fairly easy. Sponge Bob is an easily recognizable costume, even if you just get the colors correct for the pants and shirt. The basics of a Sponge Bob costume are a yellow head, brown pants, white shirt, black belt, and red tie. Interestingly, if you ever take a closer look, Sponge Bob's whole body is really a rectangle not a square. Wearing brown pants, and a yellow t-shirt is the easiest way to dress up like Sponge Bob Square Pants. Paint a Sponge Bob face and red tie on the yellow shirt and your costume is complete. If you do not want your head inside the Sponge Bob costume, follow the same directions as above but cut a hole in the top of the box for your head to fit through. Homemade Sponge Bob costumes will be more fun if you are holding or wearing one of the following accessories that appear during the cartoon in one of the episodes. To find great examples of Sponge Bob costumes check out Coolest Costumes.